With technological advances, such as the Internet of Things (IoT) and cloud computing, we have more data at our fingertips than ever before. This presents huge opportunities for businesses that can capitalise on this data – but it also presents big challenges in terms of how businesses collect, process and store information. And these challenges are only going to grow – by 2020, the worldwide volume of data will increase tenfold, from 4.4 zettabytes to a whopping 44 zettabytes (1000x1000x1000 Terabytes). Enterprise content management (ECM) systems already play a key role in helping businesses deal with this onslaught of data and smooth the flow of information through an organisation – and with the rapid development of artificial intelligence (AI), ECM systems are set to become far more powerful. AI and machine learning as a part of intelligent automatisation – the use of technology to perform tasks typically done by humans – is the key to unlocking value from all available information. Not only is Intelligent Automatisation (IA) capable of handling enormous volumes of data faster and more accurately than is possible by human intervention alone, it is also capable of learning from that data to provide even better results. In turn, AI is dependent on ECM to provide the large amounts of clean data it needs to perform at its peak. Here are just some of the ways AI is revolutionising – and will revolutionise – ECM. An AI-powered ECM solution can be trained to extract and tag documents through Robotic Process Automation (RPA), learning to automate tasks such as identifying document types based on content, identifying the appropriate action where the document should be stored, extracting key metadata fields based on values in the document, starting appropriate workflow processes and automatically respond on incoming documents. RPA tools could even be used to interpret applications, process simple transactions, and trigger automatic responses, such as sending an email. ECM solutions are already able to integrate and manage all sorts of unstructured data, including image and audio files. But with AI-powered image recognition technology, for example, pictures can be auto-tagged at upload, and text within those pictures can be captured, all without human intervention. Similarly, AI-powered voice recognition can be used to extract valuable information from audio files, allowing businesses to access potentially valuable but previously inaccessible information for better insights. Emerging semantic, natural language processing technologies “understand” the meaning of words and their relation in Dark Data unstructured documents and can provide comprehensive text analysis to identify key content elements in the document and their relations. AI won’t just influence how information is indexed, but how it is extracted. Voice-driven search queries are on track to become the dominant search mode, and companies like Google and Facebook have also enabled visual-driven searches. Expect to see these AI-powered capabilities in ECM solutions, enabling users to quickly and effortlessly retrieve relevant content. AI facilitates NLP and NLU, allowing ECM solutions to understand data and context on a deeper, more semantic level for more intelligent processing of data. With AI, the system could, for example, analyse the language used in emails and other unstructured documents to establish context and intent, and decipher things like relationships to account, projects and cases, making information easier to retrieve when it is required. Data regulations, such as the GDPR or the Notifiable Data Breaches (NDB) scheme, mean organisations have to be diligent about how they protect the data and privacy of their customers, particularly when it comes to personally identifiable information (PII). Automated redaction powered by AI can help to protect such data, thereby minimising the risk of a data breach. For example, an ECM solution could learn to recognise sensitive information (such as bank account numbers or tax file numbers) based on certain patterns, and make suggestions to redact. Eventually, the system would become accurate enough that the redactions could simply be applied automatically with a high degree of precision. Businesses typically have all sorts of data locked away in content silos, mainly in the form of complex documents that were previously too difficult or cumbersome to access. AI and ECM can unlock this data, by being able to quickly read and process stored documents to extract information, augment index information, and convert old files to newer, searchable formats. This means businesses are able to put their historical data to work, deriving new insights from them. 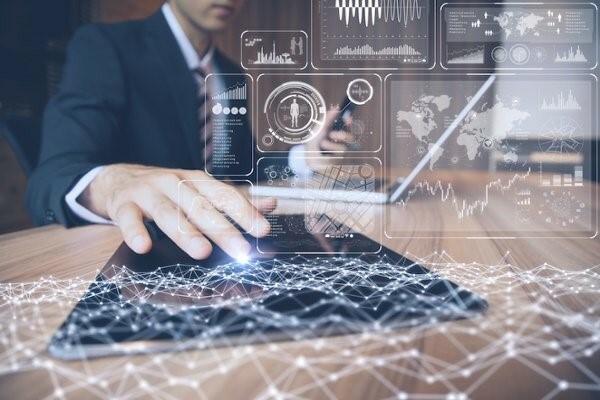 While true AI can take time to develop, businesses should look towards digitising and storing their data with a comprehensive ECM solution that provides entry level AI capabilities now , to ensure they’re poised to reap the benefits of future AI applications. Make sure your business doesn’t get left behind. Want to see how an ECM solution can prepare your business for the future? Contact us to request a demo today. Or if you’re already looking for a solution, make sure you choose the one best suited to your business with our comprehensive ECM Checklist.